The job titles of Head Chef and Executive Chef are sometimes interchangeable. However, the traditional role of head chef encompasses ensuring the kitchen runs smoothly during service times and is in charge of every element of preparation, cookery and the work rate of the staff as well as the quality of their cookery skills. 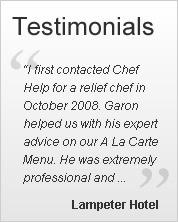 Head chefs are highly qualified and bring many years of experience with them to their role. They will often have specialised in gaining extra strings to their bow with studies undertaken in areas of particular interest in the catering industry or management qualifications. The day to day workload of a head chef is varied and they are incredibly busy from the moment they arrive at work. Days of 12-14 hours are the norm and during this time they will lead a team of hard-working staff and have ultimate control of the kitchen to ensure it runs smoothly at all times. Working at speed and being able to juggle a number of issues simultaneously whilst remaining focused on the requirements of the diners are the main strengths of an excellent head chef. They will be producing food to a budget, checking that every plate of food looks perfect and looking all the time for any issues which may be about to arise on the different food stations such as fish, meat or starters. Liaison with external suppliers will form part of the role each day as well as bringing new ones on board where required. They will also be looking to maintain a profit on every dish which is produced so will be trying to source high quality ingredients at as small a price as possible. Every member of the kitchen looks to the head chef for leadership and guidance. This can be with regards to the tasks they need to complete themselves, or for training on new aspects of their own job. To be a head chef, there’s a need for resilience and a personality of being firm but fair. A working kitchen has little room for those who want to relax and work at their own pace, everyone will be being watched at all times by the head chef to ensure they are pulling their weight equally. If you need an experienced, qualified head chef who can hit the ground running in any catering environment, talk to Chefhelp today. We have a number of hand-picked head chefs who can take on permanent roles or can instantly step into the shoes of your current head chef if they are on holiday or have called in sick. The head chef is the superhero of the kitchen in the eyes of all who work there – Chefhelp has just the staff you need with the special powers it takes to run a kitchen with professionalism, speed and top level knowledge. Contact us today to find your perfect chef.